Ancient India LanguageThe language spoken during the Indus valley civilization is still the unknown language of the Bronze Age (2nd millennium BCE). However the presence of the Indus script suggests that a spoken and written language or languages existed during this age. Since the language is not yet deciphered nor it’s corroborated through any readable contemporary source, hypotheses regarding this language is reduced to purported loanwords and substratum influences. Nothing more than this, can be said about the language spoken during the Indus valley civilization. In contrast the speech of the people during the Gangetic valley civilization is preserved in the religious texts, secular treaties and the inscriptions issued by the rulers of that time. In constructing the picture of language spoken in ancient India, Sanskrit, the language closer to many European languages come first. This is followed by its offshoot languages such as Pali and Prakrit. There are languages that came out of Prakrit and are currently spoken in India. 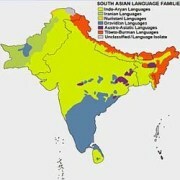 However, south India was totally unconnected with the language of the north i.e Sanskrit. Here Tamil language developed both in spoken and written form and have its own distinct history. It’s only in later times that the Tamil language was influenced by north Indian culture and many of the Sanskrit words spilled in this ancient Dravidian language. The earliest language that was spoken in India was Sanskrit. Aryan spoke a simpler tongue, more akin to classical Sanskrit. It was during the time of grammarian Panini (4th century B.C.) that the Sanskrit language reached its classical form. In all probability, Panini based his work on the languages as it was spoken in the North-West of India. His work Asthadhyayi, pre-supposes the work of many earlier grammarians. It was from the time of Panini onwards that the language was calledSamskarta, perfected or refined. Sankskrit was the lingua franca of the priestly class, and it gradually became the language of the governing class as well. The earliest surviving Sanskrit poetry is that of the Buddhist writer Ashvaghosa who lived in the Ist century A.D. He composed the Buddha-Charitra in a comparatively simple classical style. The first important dynasty to use Sanskrit was that of the Sakas of Ujjain. The Girnar inscription of Rudradaman, dated 150 A.D. is the earliest surviving example of Sanskrit prose. It was during the Gupta period that ornate Sanskrit prose was developed. The chief writers in this style were Dandin, Subandhu and Bana. With classical Sanskrit increasingly becoming the language of Brahmins and the learned few and is use restricted to certain occasions such as issuing of proclamations and during the performance of Vedic ceremonies, much simpler language called Pali and Prakritdeveloped that was spoken by the masses.It’s recoded that by the time of the Buddha masses were speaking languages which were much simpler than Sanskrit.In fact Buddhataught in Magadhi, a local variation of Prakrit, to reach more people. Pali languagePali was another popular language based on Sanksrit. Chronologically Pali is the first Sanskrit language and Prakrit appeared later on. Even the meaning of the word 'Pali' underwent changes in the course of time. In the final stages the word "Pali" meant language of the texts of ‘Theravada Buddhism’. There are also non-canonical literatures in Pali. The earliest works in Pali literature relates to the Jataka stories. The book Milinda Panda is the most important one. The classical works Depavamsa and Mahavamsa, the two great chronicles of Ceylon were written in Pali. In the towns and villages a popular form of Sanskrit, known as Prakrit, was spoken with local variations. The chief western variety was called Shuraseni and the eastern variety, Magadhi. From the earliest times to the first century A.D. inscriptions were composed exclusively in Prakrit. Most inscriptions of pre-Gupta time are in Prakritused for official pronouncements. Ashoka left behind 30 inscriptions in Prakrit. 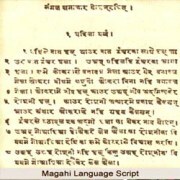 Magadhi languageEven in literature Prakrit came to be used particularly in plays. Sanskrit drama characters were made to speak in formalized Prakrit of various dialects. The women and humbler characters of the plays spoke in Prakrit. Some plays are composed exclusively in Prakrit and are technically called Jatakas. A few of secular literary works were written in Prakrit. The secular aspect of Prakrit language is reflected in texts such as the GathaSaptasati of Hala, one of the Satavahana rulers. This book consists of 700 stanzas about love depicting the varied phases of rural life. Apart from secular literature Prakrit was exclusively used as the speech of the Hinayana Buddhism. It was used for religious literature like the Jaina canonical works. The narrative literature and epic poems are fairly extensive in Prakrit. The most noteworthy among them are the Brihatkatha of Gunadhya composed in Paisachi dialect and Sethubandha of Pravarasena. The first writer to make use of Prakrit wasAsvaghosa in his work the Buddha-Charitra. The others who followed the example were Bhasa (3rd century A.D.) and later Visakhadatta and Kalidasa. Prakrithas linguistic importance since it is illustrative of the linguistic evolution from Prakrit to Apabhramsa and finally to a new regional languages of India. Apabhramsa meaning falling down was a corrupt form of Prakrit dialect. It is believed to have originated in the north-west and travelled along with the migrant people who settled in central and western India. Stray poems dealing with morals maxims ethics religious discourses and legends were commonly written in Apabhramsa. In the Apabhramsa, the meter doha was adopted as powerful form of expression of religious and philosophical thoughts. Among the Jains literature the voluminous texts on the life and activities of Jaina heroes were written in Apabhramsa. TolkappiyamTamil was the oldest spoken literary language of south India. Evidence shows that there are a body of literature in Tamil that has unbroken continuity for over 20 centuries. The first period of Tamil literature is associated with the Sangam Era. Tamil tradition refers of three literary Academic (Sangams) which met at Madurai. Tolkappiyam is the earliest surviving book in Tamil was compiled during second Tamil Sangam. 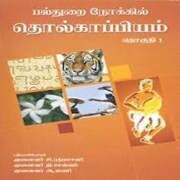 It is a work on Tamil grammar literature tradition and sociology. Tolkapiyam lays down grammatical rules governing the literary compositions. This book is the fountain of all literary conventions in Tamil literature. It was written by Tolkappiyar along with eleven other scholars. The poets of the third Sangam wrote Ettuthogai (eight anthologies). These anthologies contain well over 2,000 poems ascribed to more than 200 authors. The other major collection of the Sangamperiod is the Pattuppattu of ten dyle, which are long poems. Thirukural is the Bible of Tamil landand consists of series of metrical proverbs and many aspects of life and religion. Two books Silappadikaram (the Jewelled anklet) and Manimekali are of poetry having long poems. The book Manimekali abounds in fine poetry and its dramatic element is of master class. This book also gives us glimpses of the development of fine art in the Sangam age. They are attributed to poet Ilangoadigal and Sattanar of Madurai. Both the books belong to the early centuries of the Christian era. The age of the Sangam literature was religious but stranger to the Bhakti cult. The chief quality of the Sangam works is their adherence to standards and literary conventions. Prior to the imperial Pallavas many Tamil works were written like Kural. Kural is one of the most important forms of classical Tamil poetry. It is a very short poetic form, exactly in 2 lines, the first line consisting of 4 words and the second line consisting of 3. Kuralwas written by Thirulluvarand now translated to many languages. In the later period the Tamil writings of the Alvars and Nayanmars were quite distinct. Both of them were written somewhere in the 5th or the 6th century A.D. The origin of the other languages of India has occurred during the early medieval period but the root of most of them has Sanskrit, pali and Prakrit. Some of the languages have developed from the dialects of these original languages. Currently, there are over 780 languages and 66 different scripts in India.